One time, in referring to me making a painting in a short amount of time, someone asked me, "Can't you just whip something up?" The answer is no. I have self imposed issues with painting just for the sake of painting...I always paint in order to make something really great...sometimes I get it..other times I beat myself up. But the point is, that my process is not one for rushing. Each painting I make takes me a minimum of two days. The first day I sit down to paint, I apply heavy layers of acrylic paint...scratch and write into the wet surface (above, photo left) and get what I call the "bones" in place. I allow that first phase to dry completely and then come back in the next day with the "details". The detail phase allows me to shift color gradually, add accents of color (in this case the rust areas and the blue in the lower portion) and smooth everything out. The "details" phase brings my paintings to life. 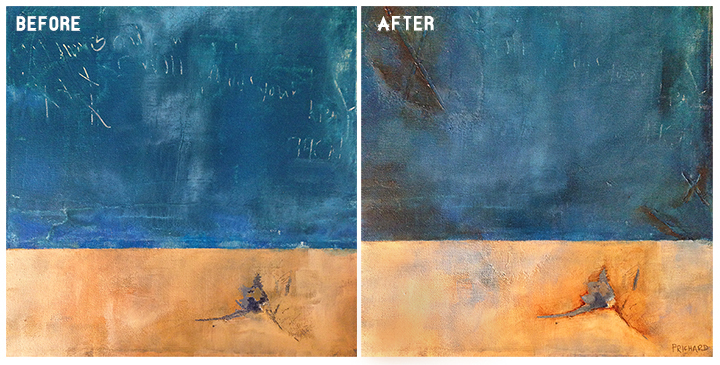 The painting becomes more rich...the layers are more vibrant..the "flatness" of the base layers of paint is gone. "Borrego" is coated with a thick layer of self-leveling gel..which pulls and cracks. Fitting, right? The desert floor right here on my wall. We teach these techniques in depth in our online mixed-media workshops. Click here for more info and to see all of our sample art. Thanks for stopping by today.